I used to own one of these, sold it a few years back. The stand is a thunder machine, horrible. I didn’t have that problem with the tailstock and don’t have the lathe anymore to look at but going from memory it works off compression and should be easy or impossible to fix. :) The handwheel works okay? The tailstock casting is aluminum. The original Delta was cast iron with cast iron legs but Rockwell cheapened it. I repainted/refurbished mine, added variable speed, and sold it for quite a bit more than I paid. It’s not a bad lathe for spindle turning and small bowls but I would build a new stand. The handwheel works fine. Yes, it works from compressing the casting against the ram, but it won’t compress enough apparently. I thought about extending the cut, to get more flex to the casting, which sounds like a great way to completely wreck it. Check the compression slot to make sure it isn’t packed with crap, and verify the nut on the bottom of the handle is seated properly. Easiest way is to eject the quill completely and use a flashlight. I’ve had it completely apart and off the bed several times. All cleaned, nothing in the slot, nut seated. It just won’t close the slot enough to hold the ram. No matter what I did, I couldn’t make the lock hold the ram. So I made a new one. There’s about 1/2” of aluminum at the end of the tailstock, so I drilled and tapped it. 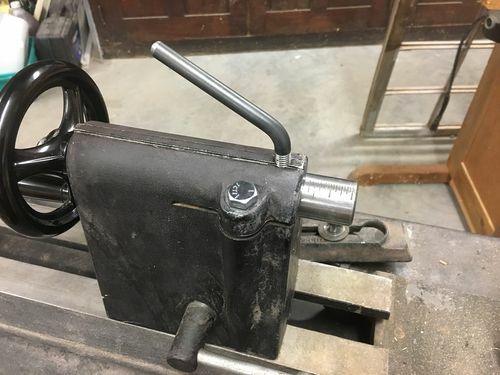 A threaded and bent piece of 3/8” rod bears directly on the ram, and doesn’t take a lot of force to hold it. I think if I keep from horsing on it the aluminum threads should hold up. I put a small piece of brass in the threaded hole so the new lock doesn’t gall the ram. I put a bolt in the old lock lever hole, since tightening the new lock would tend to pull that cut apart and loosen the whole thing. It also helped to take up some slight wobble in the ram. Now I can get to cleaning it up and rebuilding the wobbly stand, and start learning how to turn! I have that same lathe never had a problem with the tail stock. Looks like you have a good fix for your problem. I finally cut a piece of 3/4 ply and put on top of that sheet metal stand then bolted lathe thru it. That help with the thunder and vibration a bunch, I also put a 3/4plu shelf on the cross braces and will eventually throw some sandbags on that and that should help a bunch more. The lathe itself is not too bad a lathe but the stand needs to go away. Bruce, plywood on the top and a shelf was my plan as well – glad to know it’s going to help. I have a bunch of wheelweights I plan to put in some shallow wood boxes on the shelf for weight.